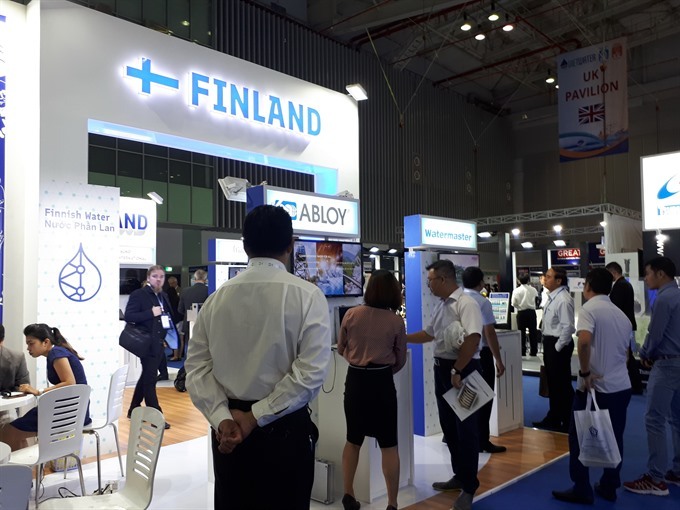 HCM CITY — Finnish companies will continue to invest in the development of Southeast Asia, including Việt Nam, particularly in the conversion of waste to power, according to Finpro, the national trade promotion office of Finland. “Finland is a world leader in waste-to-energy technology, and this has proven to be a segment of singular interest to Việt Nam,” said Saku Liuksia, Finpro’s programme manager of waste-to-energy and bioenergy. Saku was the leader of a delegation of 16 Finnish exhibitors to Vietwater 2017 expo ended in HCM City on Friday. “Việt Nam has long struggled with issues of waste management, with a recent study estimating that HCM City alone is discharging 8,300 tonnes of waste each day, and 76 per cent of that waste is ending up in landfills. “Meanwhile, power shortages and outages remain a part of daily life in the city, and some leading Finnish companies are at the forefront of addressing both of these issues,” he said. Since Finpro’s last Vietwater appearance, much progress has been made by Finnish companies operating in Việt Nam’s clean energy space, particularly in converting Việt Nam’s waste problem into a solution for Việt Nam’s power-shortage problem. He highlighted the local efforts of several such enterprises, including Doranova, which offers advanced solutions for contaminated sites remediation and transforms waste into renewable energy; Watrec, which has prioritised Việt Nam for its development of biogas technology; and Valmet, which efficiently creates energy from biomass and waste. Mikko Saalasti, Doranova’s head of renewable energy, said the company’s waste to energy project was expected to ‘fire up’ for the first time next month. His counterpart at Watrec remarked that the company made numerous visits to Việt Nam in the past year, including Vietwater, and has accompanied Finnish ministers to Việt Nam to discuss waste treatment options that the company can bring to make the country cleaner and greener, on the streets, in the waterways, and in the generation of power. “We have placed Việt Nam at the top of our list of development countries,” said Kimmo Tuppurainen, area sales director for Southeast Asia for Watrec. “At present, our waste to energy project in Hà Nội is commencing. It is a total solution project that takes Hà Nội’s municipal solid waste, sorts it and converts it to bio-gas and other materials to be incinerated. Reflecting on the time he spent at Vietwater, Matti Miinalainen, Valmet’s director for Asia Pacific & China, said: “Việt Nam is developing rapidly toward renewable sources of energy, and with a special focus in the waste to energy sector. We have a superb offering in this space from which Việt Nam stands to benefit immensely.